Dogs love the comfort of a cozy, solid wood home. You love the beautiful Amish craftsmanship and dual-use furniture. This dog crate tv stand may be exactly what you need to serve as a solid wood crate for your small to medium size dog and a dog crate entertainment center for your TV. Choose your wood type, wood finish, and options, and place your order. Dog crate furniture is the next big thing in a pet friendly home. 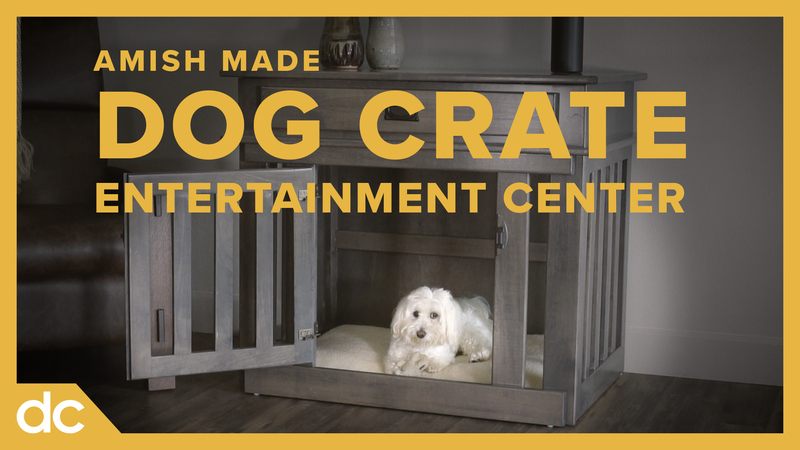 But not all tv stand dog crate is built the same: our Amish craftsmanship in furniture carries over into the best in dog crates wood furniture. This isn’t just any indoor dog kennel. We pride ourselves in only the highest quality solid wood furniture and, in this case, dog crate entertainment center. Or shop all pet furniture. Pick from a number of options, made to order. Choose from a maple dog crate, oak dog crate, or cherry dog crate. Then select your finish! Add a drawer or keep it simple with no drawer. Order with a waterproof linoleum tray, a custom-fit memory foam mattress in the bottom, or both. And even customize it with your pet’s name carved into the wood!